Beginner or not, we are always looking for ways to accomplish tasks faster on smartphones and tablets. One area in particular would be in app management. How often do you install a new app or game only to realize after a couple of minutes that it has no place on your device? As someone that installs multiple apps per day, I can tell you that it happens to me on a regular basis, so uninstalling quickly has become more important. And thanks to updates in Android, this task is now easier than ever to do. 1. 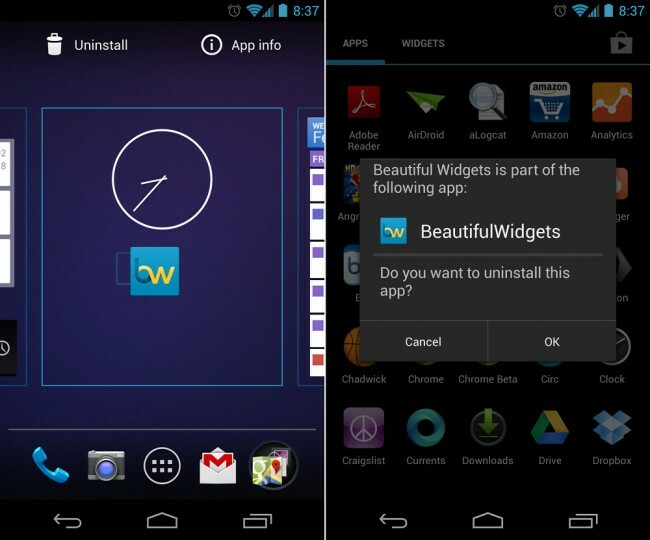 From your app drawer, find the app that you want to uninstall. 2. Grab it by long pressing on it for 2-seconds. 3. With control of the app, depending on your device, you should see shortcut options in the notification bar. *In the screenshot, you can see that I have “Uninstall” and “App info.” Some devices are different in this area. For example, Motorola phones only show a “More Options” area. Once dropped there, you’ll get a menu with an option to uninstall. Samsung phones running TouchWiz do not have either shortcut. To quickly uninstall, hit Menu>Uninstall while in the app drawer and then select the apps you want to remove. HTC phones tend to show an “Uninstall” options. 4. If your phone shows the “Uninstall” option, drop your app there and then hit “OK” to uninstall. 5. If you only see “App Info” or “More Options,” drop your app there. 6. You should then see a box which allows you to uninstall the app. And that’s it, you are now on your way to removing apps in the fastest way possible.